In the way of travel, every gal has a list of must-haves. On the top of that list is a good travel duffle. 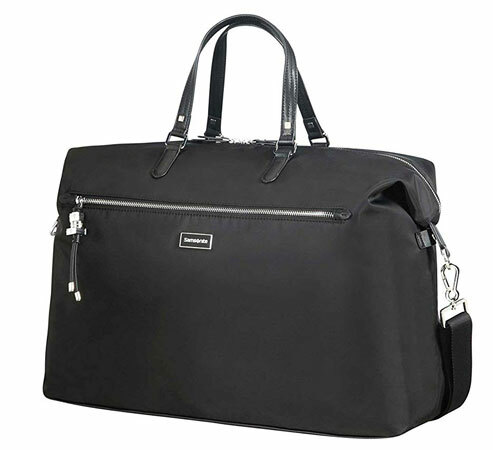 While usually thought of being more masculine, this classy modern duffle from Samsonite has a charm feminine without sacrificing the convenience of a classic “stuff all your stuff in duffle”. Find out why the Samsonite Karissa Biz Duffle is such a hit for by reading on. 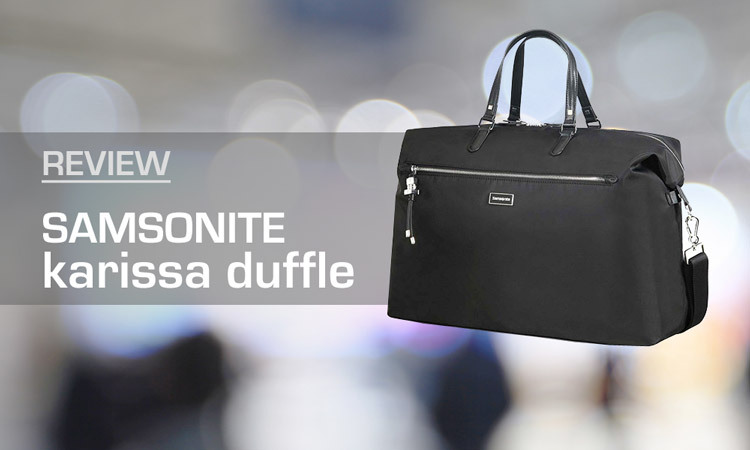 The Samsonite Karissa Biz Duffle is a feminine duffle in an understated dignified way. This classy bag is well-crafted of durable Nylon and Polyurethane materials that is easy to clean and maintain. It’s equipped with a exterior zippered pocket for storing items you need to accesses quickly like travel documents, a cell phone or a make-up compact. The strap is adjustable and removable for convenience and preference. Unlike a lot of duffle bags the rear side of this bag comes with a vital smart sleeve so you can loop this beauty onto your roller luggage. 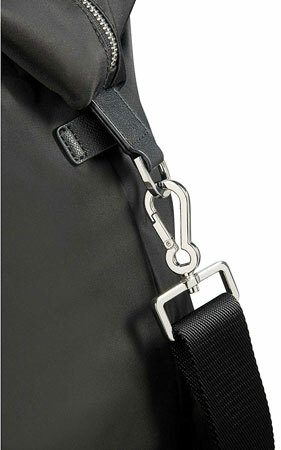 I love how Samsonite choose simple metal hardware to give the bag a contemporary look. This bag’s beautiful simple design is perfect for modern, feminine travelers. 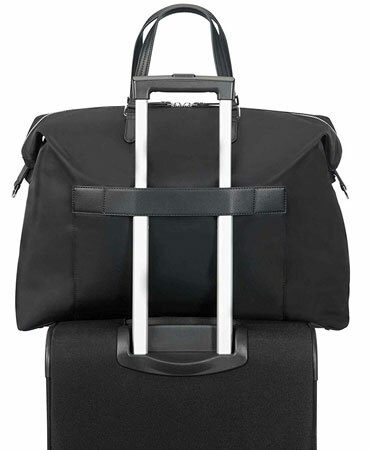 The Samsonite Karissa Duffle comes in two classic colors. Black, with silver hardware, and light taupe with gold hardware. Both colors are very practical and versatile. 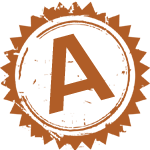 The light taupe is a nice change from your standard blacks or greys. It’s a refreshing look excellent for all seasons. Inside is a large main compartment that could easily store a couple light outfits, a pair of shoes and a toiletry bag. It would be good as a overnight bag, or as a carry-on personal item you can easily slide under a seat. The interior is not over complicated with lots of pockets. A simple zippered pocket is provided for small items you want to keep separate like jewelry or chargers. There are also two small opened top pockets well suited for writing utensils, lipstick, and/or cell phone. Outside of personal use as a travel bag, this Samsonite duffle is great for modern business women and well equipped for business needs. A tablet, laptop, files, notebooks or other business essentials would comfortably fit inside with ease and convenience. However, if you like a bag with more pockets, this may not be the one for you. We suggest more of a tote style bag like the Briggs & Riley Baseline Travel Tote. Since the Samsonite Karissa line is a relatively new line from Samsonite there are not many reviews online. However, this duffle made from high quality nylon material appears to hold up to the Samsonite reputation for quality durability. The exterior appears to be very sturdy. This bag is very unlikely to rip or tear because of the nature of the fabric. It’s also water repellent and easy to wipe down and clean. This is a duffle with promise. Chances are you’ll be able to use this bag for years without problems. As with most Samsonite products, this bag is pricey. At $190, depending on the sale, it’s in the higher priced category of luggage carry-ons. However, remember it’s a Samsonite, a company well-known for their long lasting quality. So if you’re ready to commit to a long term-duffle, or you have a little extra cash to throw at a bag, this one is unlikely to disappoint. What a gift it would be to a special lady in your life! This beauty would show you really care to buy her something more than just trendy. User reviews on various websites average around 4.9 stars out of 5. The reviews on this product are limited because it is a new line for Samosite. That being said so far, so good. Users seem to agree this duffle is consistent with the Samsonite reputation for quality travel gear. All and all duffle bags are nice item to add to your travels for convenient packing. 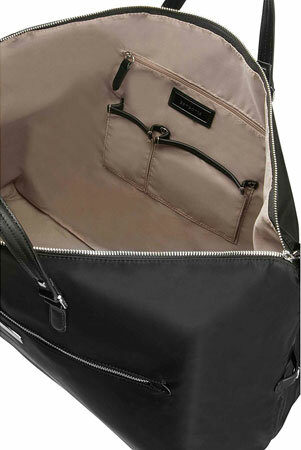 With the number of feminine and modern duffle bags being limited this bag from Samsonite is a great buy. It’s simple, clean look and contemporary style make it versatile and appropriate for all seasons. The durability guaranteed with a Samsonite makes this duffle a worthy investment for long term use. Although it’s pricey, the quality and design of the Samsonite Karissa Duffle is something you can depend on. You can find this duffle on Amazon.